Paintballers and airsofters in general spend a disproportionate amount of time honing stealth techniques for tactical gaming, and rightfully so. Noise and light discipline are essential to remaining elusive. Yet some of the most successful teams employ a great deal of noise and yelling to seemingly fantastic results. So which is it? Should noise and light discipline be enforced, or should these considerations be scrapped for running amuck while yelling back and forth? The answer is, oddly enough, both. Up until the moment the team is engaged and trading shots with an enemy force, stealth must be employed. Stealth allows us to maneuver to a point and attack from a direction that the opponent is ill-prepared to defend. What’s more, stealth allows us to elusively withdraw from that very same position if the situation no longer looks favorable. So stealth is a critical tactical factor in regard to maneuver, mass, and surprise. However, once engaged by enemy fire any notion of stealth is futile—even counter-productive. More than half a century ago General S.L.A. Marshall coined the phrase “organized chaos” when referring to the battlefield. His premise was that although a battlefield is comprised of numerous individual gun fights that are chaotic beyond any semblance of control, the battle can still be won by focusing all of this chaos toward a single, unified goal. This premise holds true today. Can vocal commands really be expected to unify everyone toward a single goal over the chaos of battle? Frankly, yes. Communication threads its way through every facet of MILSIM game play and that most definitely includes vocal commands. Let’s take a moment to review. 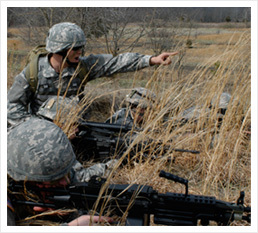 Field craft are those skills each individual troop needs to survive and succeed on the battlefield. Namely that means shoot, move, and communicate. 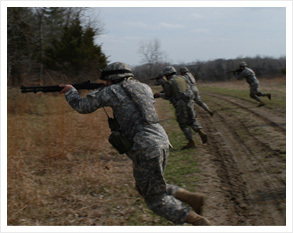 Battle drills are the rehearsed plans in the portfolio of each fireteam, squad and platoon that enable the team to initiate or react to enemy contact. Each drill must be communicated before it can be executed. And tactics are those plans that require careful deliberation, risk assessment, and the arraying of combat power against an enemy force. In each of these cases—field craft, battle drills, and tactics—vocal commands are the means of disseminating information and executing maneuvers. More to the point, since no plan survives the first shot, vocal commands become even more critical as the small unit leader adjusts the plan to the ever-changing battlefield situation! More commonly than not, this information is given by vocal command and not by radio or hand and arm signal. So, vocal commands are used to initiate action against the enemy, and they are used to adjust the plan and transition into the next battle drill or phase of the operation. But vocal commands have far more depth than merely being a means of communicating battle drills over the roar of combat. Teams achieve some semblance of situational awareness through vocal commands, and that is equally as critical and significant as the dissemination of information. When the BBs start flying and chaos rears its ugly head, most troops head straight for the ground. That’s logical enough, but in doing so they unintentionally isolate themselves from other members of their team. Commonly this means the leader cannot be seen. Vocal commands can help overcome this isolation. Leaders who bark out commands while under fire instantly reassure their troops. First because the troops are able to confirm that their fearless leader is still alive and functioning; and secondly, the troops are now able to identify an approximate distance and direction to at least the leader of their unit. Combat isolation is broken, offering a momentary relief and resurgence in confidence. When troops respond verbally to the leader’s vocal command, there is a synergetic effect that bolsters the confidence of all team members within earshot. And again, the team’s efforts are now refocused on a common objective. That’s the brilliance of vocal command—some of it is obvious, some of it is more subtle. Over the chaos of battle leaders must shout out orders and provide a common goal. With their confidence renewed, team members yell back to identify enemy positions and obstacles, further feeding the leader’s situational awareness. And again, the leader uses vocal commands to adjust to the constantly changing battle. It sounds chaotic. It looks chaotic. But as long as the unit is continually pushed toward a common goal, organized chaos actually favors the team. Experienced teams know this, either consciously or subconsciously. If your team sounds more like a swarm of church mice in battle, you might want to give this yelling stuff a try.